This article conveys a sense of urgency, a warning that a crossroads has now been reached that obliges action, and also one of opportunity, suggesting that in 2014 a path forward is within reach. It asks why a compromise on the “comfort women” issue was not reached in 2012, despite the effort to find one. One answer for the lack of resoluteness to reach an outcome in Japan was what Park Cheol Hee calls public reaction to the “contempt for the declining status of Japan in international society.” symbolized by the succession in 2012 of provocative moves by South Korea, Russia, and China toward disputed territorial issues. Whatever may have held South Korea back previously, close attention to Abe’s every right-wing move also has reduced the inclination to find common ground, leading a suspicious Park Geun-hye to delay any serious talks that could lead to a summit. Increased US involvement in the fall put Korea on the defensive to the point that some expected a way forward to be found soon. 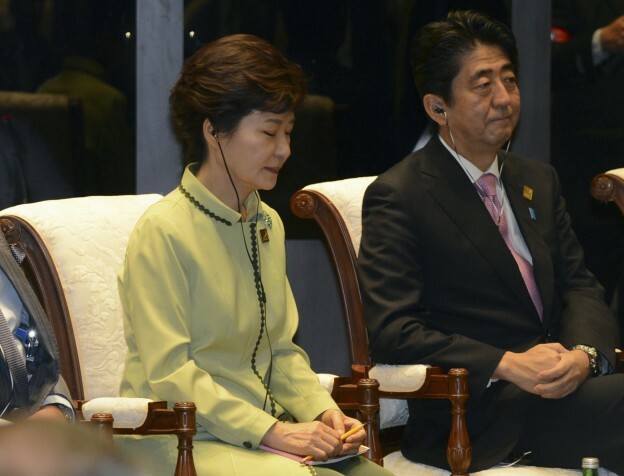 Park Cheol Hee argues that low-level diplomatic dialogue continues after the Abe visit to the Yasukuni Shrine, and Seoul is awaiting an overture from Tokyo, at a time when Washington is putting the onus on Tokyo too. Thus, he sees some hope. If we follow the implications of this proposal, what is required from three countries? Park Cheol Hee’s recommendations call for action and assurances from three sides: Tokyo, Seoul, and Washington. First, Abe needs to make clear that he will proceed in a manner that will not embarrass Park Geun-hye, will resume the effort of 2012 to find a way to compensate the “comfort women” beyond wha t was tried before, and will avoid escalation in propaganda concerning the Dokdo/Takeshima issue. While these would all be stretches for Abe, disappointing his base, they, arguably, fall within the realm of possibility. In return, Abe would receive some benefits much welcomed in Japan. Presumably, the aggressive Korean campaign to demonize Japan over history as well as Park’s effort to make Abe a pariah would stop. These have taken a heavy toll on the way both sides perceive each other. Also, Korea would, Park Cheol Hee suggests, agree to a plan for compensation of the “comfort women,” and also to a joint effort to provide compensation to the Korean forced labor who toiled in Japanese factories or mines. All of this, one assumes, is to be accompanied by an upgrading of defense cooperation. Park Cheol Hee proposes a timely, quiet nudge to both sides by the United States. This is a point deserving more attention. Further discussion of the US role is now occurring in Washington. In late 2013 some urged the Obama administration to press a recalcitrant Park to make peace with Abe for strategic reasons. Since Abe’s visit to the Yasukuni Shrine, some are pressing it to put pressure on him to make a one-sided retreat on historical issues, especially with Seoul in mind. Park Cheol Hee recognizes that a quieter US role is preferable, and it should seek joint action with Abe and Park in the lead, not acting as if they were under some sort of US threat. Also, Park disassociates the challenge or urgency of the Japan-South Korea problem from that of Japan-China relations. Now that the vitriol has spilled over to the United States, as seen in the struggle in the state of Virginia over requiring textbooks to add the name “East Sea” to that of “Sea of Japan,” the case for the Obama administration becoming actively involved is strengthened. What might timely, quiet US leadership be? Obama might act in advance of his trip to Asia in April, using the urgency of making that visit a success as a stick to elicit quick action. He could indicate that he plans to visit both Tokyo and Seoul, and in doing so he wants to make a contribution to reconciliation. One aspect of that is for both to agree to suspend the public relations battle in the United States, as Obama asks the Virginia State Assembly and others to refrain from action in order to give time to Abe and Park to explore a detente in exporting their conflict. Should North Korea take some provocative action in the coming months or even in response to a report about its growing threat, another aspect of US leadership would be to define collective defense in such a way that Japan-ROK defense cooperation will be seen in a new light. Finally, a third aspect is to bring a broader conception of values to the fore, highlighting shared views of human rights and even history that have been rather obscured of late. Using the danger of deteriorating Japan-South Korean relations as justification, Washington might put the onus on Abe to clarify his claims of support for universal values and eagerness to improve ties to Korea. These are possible implications of the arguments Park Cheol Hee is making in his statement.